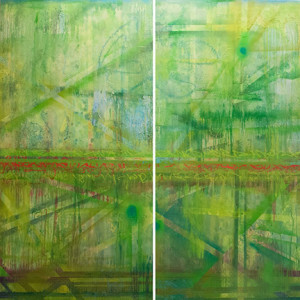 Kelly L. Walker paints with zeal and confidence, committing spontaneous reflections of her mood and emotions to canvas. 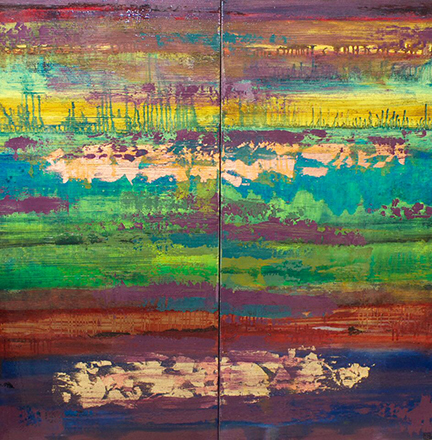 Walker’s abstract paintings demonstrate the techniques, textures and patterns she employs as a professional decorative painter. Utilizing a wide range of atypical materials, her works are intricately layered and her surfaces defy explanation, calling reference to landscape, graffiti, and color fields. Walker’s artwork has been featured at venues both in and outside the Baltimore area, recently including the Rosenberg Gallery, Silo Point, Gallery 1951 in Los Angeles and the Delaware Museum of Art. As a self-taught artist, I am in a perpetual state of challenging the mediums I employ and learning from them. My work is organic and uncensored, but often references land, sea or skyscapes. I don’t have intentions when working or any particular outcome, and value the happy accidents that come from multi-layering through many start-overs. These start-overs cannot be overlooked as valuable. In the end, I want to make the world a more beautiful place.